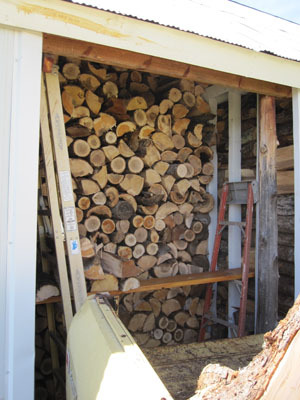 Our winter’s wood is stored in a lean-to attached to our garage. The very back row of firewood is pretty tall… probably over 12′. My technique for doing the firewood up until this year has been to haul the logs from the woods to a spot near this lean-to. Then I’d cut them up, split the chunks that were too big, and carry the firewood under the lean-to roof. Things went swimmingly until the pile got taller than I could reach. Then I had to climb a ladder with as many chunks as I could carry, place them on the pile, get another load, and repeat. It took a long time. This year I’m hauling all the firewood that I’ve cut and split with the Scout, which I back up very close to the lean-to. I tried to think of a way to avoid going up and down the ladder, and came up with two ladders and a plank, or what is often called scaffolding. Since the firewood that is sitting in the back of the Scout is already 3′ off the ground, I made the scaffolding about a foot higher than that. I gathered the wood from the back of the truck, stepped onto the scaffolding, and haven’t had to climb a ladder yet this year. It goes much faster. We got rained out of the woodpile project yesterday. Today was a great weather day for working outside, and I got quite a bit done. If I have a good day tomorrow, I should be close to finishing up the woodpile for this year. This entry was posted on Monday, July 29th, 2013 at 9:30 pm and is filed under Uncategorized. You can follow any responses to this entry through the RSS 2.0 feed. You can leave a response, or trackback from your own site. You have your wood act together, Ted. We are getting there. Believe it or not we had a small fire burning all day yesterday…gotta love the three dog days and nights of summer.